It’s been known for some years that focusing on a few critical factors - such as clear purpose, visible leadership, engaged stakeholders and effective governance - can significantly enhance a change initiative’s chances of success. And yet consistently fewer than 50% of initiatives successfully deliver their expected improvements. Why is this? Could it be that people find it hard to deal effectively with all the factors that might contribute to their success? If so, what can be done to break through the inherent complexity of change and create initiatives which are more likely to succeed? This question is at the heart of our business. We have already developed a Rapid Assessment to help clients understand how they’re performing against what we see as the top ten Critical Success Factors. This has been very effective in identifying areas for improvement (see ‘Spotlight‘). But we wondered if we could do more to help busy executives, seeking to change their business whilst keeping the operation going in difficult times, focus on those factors which would do most to improve their chances of success. So we set about surveying professionals from around the world who have experience of shaping and delivering change. The survey asks them to rank our top ten Critical Success Factors “in order of their importance to the overall success of a change initiative”. It’s still in progress, but the findings to date provide some useful insights. As one of our respondents said, it’s “hard to rank the critical success factors - none of them are ‘nice to haves’”. But the data so far clearly suggest that some factors are more critical than othersˆ. Leadership, Purpose and Stakeholder engagement were consistently ranked as the most important factors. On the other hand, Performance Management, Delivery Process and Governance were typically ranked as least important, with the remaining four factors somewhere in between. Assess your initiative’s performance against the Critical Success Factors - using our Rapid Assessment, for instance. Then, fix the issues in the areas which will make the biggest contribution to your initiative’s chances of success first. Drilling down into the data offers some further preliminary insights - particularly regarding the differences between small and large initiatives and between the perspectives taken by different professional disciplines. Around 40% of our respondents had experience on initiatives of $10M or more and this group gave even more weight to Leadership and Purpose. They also gave more weight to the Business Case & Funding, Governance and Performance Management - all of which are essential to get a large initiative on track and keep it there over several months or years. Why? We suspect because the broader the impact of the change on your organisation and the longer it takes, the more volatility you will face. These factors are the ones that will help you manage that volatility. So what? Leadership and clarity of Purpose are essential to keeping large initiatives on track over the long term, but don’t forget that you will also need to build flexibility into your Business Case and Governance arrangements, in particular, to allow you to adapt when necessary. Change Management professionals typically place more emphasis on Leadership, Business Case, Resources, Governance and Delivery Process, whereas Project & Programme Managers place more emphasis on Purpose, Stakeholders, Blueprint & Roadmap, Plan and Performance Management. Much of this can be ascribed to their different perspectives. Project & Programme Managers are very often tasked with delivering an initiative “on scope, on time, on budget” in which clarity of objectives, targets, plans and status are critical. On the other hand, as many of the Change Management respondents highlighted, their focus is much more on engaging the whole organisation and helping to lead them on a journey towards owning the change once delivered. So what? Maybe the important point here is not that either Change Management or Programme Management professionals are right or wrong, but that each brings a different but valuable perspective to the process - i.e. both are right. A well-balanced blend of these perspectives is most likely to lead to success. We’d like to thank everyone who’s contributed so far - and if you haven’t yet completed the survey, please go to http://houghley.csf-pt2.sgizmo.com. Along with the rankings, a lot of respondents suggested alternatives to our top ten factors. Many of these emphasise particular aspects of our existing factors - such as different ways in which Leadership is vital to, and can be engaged in, the success of an initiative. Others took different perspectives, such as the application of psychology to building ownership of change and the importance of testing. We’ll include a fuller analysis of these suggestions with our final results. Ultimately, we’re planning to use the final results to enhance our existing Rapid Assessment. Our idea is to combine the weightings with the assessment scores to help busy executives focus quickly on those factors which are likely to have the biggest impact on their chances of success in their current situation. 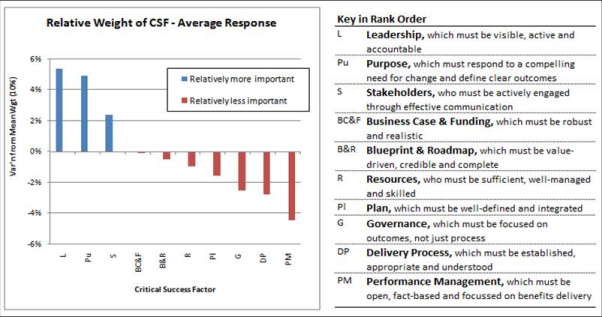 From the results so far (see right), addressing the top three ranked Critical Success Factors of Leadership, Purpose and Stakeholder engagement could contribute almost half the available improvement in an initiative’s chances of being delivered successfully. We’ll publish our final results, together with our updated Rapid Assessment model, in October. Everyone who asked for a copy when they completed the survey will be sent one automatically, and the results will also be published on our website. In the meantime, we’d like to get your feedback on these preliminary findings - please let us have your thoughts by leaving us a comment below or e-mailing us at enquiries@houghley.co.uk.